Find hotel near The Centre For Computing ..
Can you believe that there will be a generation of people who have no idea what a cassette player looks like? Or even a cassette, for that matter. Gone are the days of personalized, handwritten letters that took days to deliver, gone are the days of developing film in order to print out pictures and, to be more up to date, gone are the days of dial up internet! In an Isaac Asimov-esque future, one will step into a museum and survey, with great amusement, the ancient relics that will be the home computer and corded telephones. Toensurewe don’t forget the details of this phenomenally fast paced day and age is the Centre for Computing History. Created in 2007, the centre is a registered educational charity and is funded by a combination of sponsors which consist of local business and authorities as well as private individuals. Venture capitalist and entrepreneur Hermann Hauser became patron of the museum in 2011. The centre was established as a pioneering educational charity to tell the story of the ‘Information Age’ and those who created it, thrived in it and those who were left in the dust. Since this is a relatively new topic, the Centre’s subject matter is quite refreshing. 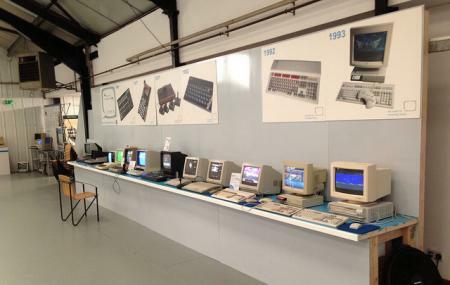 The museum houses vintage computers and comptometers, games consoles, software and an extensive collection of magazine articles and other written material that documents the growth of this age. It’s said that as every minute passes by, information is being put out at double the current rate, which implies that there is more information out over the internet than our minds will ever be able to process! Who are the people behind this accelerated age of public knowledge? It’s here you’ll find out. In a very short space of time, this information industry has created multi billionaires out of some, paupers out of others and Farmville addicts out of the rest of us! It’s in this centre you’ll learn about the people, inventions and machines that have played key roles in this on-going story.Definitely a modern day must-see soon-to-be museum hidden in Cambridge. Also, visit the popular attractions in the city by following Cambridge itinerary 1 day. If you love video games, you’ll love this centre as they have fully functioning models of old gaming hardware, which you can actually play on. Expect to see Pacman arcade machines, space invaders, BBC computers for old skool coding. Getting there: The museum is at Rene Court in Coldhams Road, Cambridge, CB1 3EW, very close to the Beehive Shopping Centre. From the Beehive Centre, take the 3rd exit off the roundabout into Coldhams Road and go over the railway bridge. Immediately after the bridge there is a very sharp, left hand turn that doubles-back on yourself. Take that turn into the commercial estate and follow the road to your right. Just before the railway crossing, turn into Rene Court on the right and you will see the Centre there. Babies,5 years and under: Entry is free. How popular is The Centre For Computing History? People normally club together Anglesey Abbey and Virtual Aviation Flight Training Centre while planning their visit to The Centre For Computing History. This is a fantastic place to visit to learn and reminisce about all things computers, retro video games, old arcade machines, history of the computer (more specifically the history of Cambridge and the computer) and much more. The museum is well laid out but absolutely packed full of computers/consoles all of which you are able to use. It's great to take a trip down memory lane or to discover something new. Reasonable price, lots of events which take place throughout the year and aimed at all ages, perfect for families. The cafe is your normal snack bar so no full meals unfortunatey but the gift shop has plenty on offer with retro related items and other items to remember your visit. Overall it's a highly recommend place to visit if you are in Cambridge and certainly worth it for Computer and Video game enthusiasts. Great museum highlighting the development of computing and video games with plenty of things to try out and had great fun playing some of the retro games. Also saw my first ever home computer - the Acorn Atom - which was designed and built in Cambridge. Well worth a visit. Really great place to visit to learn about the history of computers, computer games the internet. Lots of interactive stuff to including games to play and computer to program. Will definitely visit again. Worth a visit - fairly large collection of retro home computing and video game consoles with an original arcade space Invaders and centipede. Great nostalgia for a teenager of the 80s such as me. Bit shocking to realise that the Apple Mac I did my degree thesis on in 91 is now considered a museum piece! They have a Sinclair c5 'car' as well, and in fact most of what Sinclair produced alongside most of the big name early home machines. This centre is a must if you are going to Cambridge and a fan of technology. There were old computers and old gaming consoles (which you could use and try out). At the entrance, there is a small souvenir stall where you could buy something as a memory. Yes, they do have toilets and easy parking, and tiny snack shop. One cool thing was that at the end there was a playstation vr set that you could play with (for a whole level) for £2. The only problem is that the main room is really cold, but that didn't really bother me.